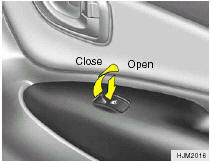 The power windows operate when the ignition key is in the "ON" position. The main switches are located on the driver's armrest and control the front and rear windows on both sides of the vehicle. The windows may be opened by depressing the appropriate window switch and closed by pulling up the switch. To open the window on the driver's side, press the switch halfway down. The window moves as long as the switch is operated. To fully open the driver's window automatically, press the switch fully down. In automatic operation, the window will fully open even if you let go of the switch. To stop at the desired opening, pull up and release the switch. In order to prevent operation of the passenger front and rear windows, a window lock switch is provided on the armrest of the driver's door. 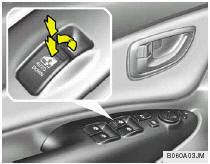 To disable the power windows, press the window lock switch. To revert to normal operation, press the window lock switch a second time. The power windows can be operated for 30 seconds after the ignition key is turned to the "ACC" or "LOCK" positions, or removed from the ignition switch. If the front doors are opened during this 30 second period, the power windows can no longer be operated without the ignition key turned to the "ON" position. (1)Be careful that someone's head, hands and body are not trapped by a closing window. (2)Never try to operate the main switch on the driver's door and the individual door window switch in opposing directions at the same time. If this is done, the window will stop and cannot be opened or closed. (3)Do not leave children alone in the car. Always remove the ignition key for their safety.